“Water resources could become a problem in the future that could escalate tensions not only in our region, but on every continent,” former Uzbek president Islam Karimov famously told reporters in 2012. “I won’t name specific countries, but all of this could deteriorate to the point where not just serious confrontation, but even wars could be the result.” The “specific countries” Karimov neglects to name are Uzbekistan, Kyrgyzstan, Tajikistan, Kazakhstan, and Turkmenistan, states in which the uneven distribution of two key resources —water and fuel— escalate the risk of regional conflict. In 2018, the issue of these two resources remains at the forefront of relations between countries in Central Asia, with no short-term solutions in sight. The origins of the conflict are the product of geography. Two states, located upstream at high altitudes —Tajikistan and Kyrgyzstan— have plentiful water. Two rivers, the Syr Darya and the Amu Darya, supply 90 percent of Central Asia’s water, passing through these two states before moving northwest. The three downstream states —Kazakhstan, Kyrgyzstan, and Uzbekistan— have scant water resources, but are endowed with coal and natural gas. Most energy in the region, including the water-rich upstream states comes from natural gas and coal reserves in these downstream states. The problem lies in the fact that the downstream states —Uzbekistan, Kazakhstan, and Turkmenistan— now sell their energy resources abroad for extra revenue. Conversely, the upstream states —Kyrgyzstan and Tajikistan— have been using excess water to produce their own power via hydroelectric power plants. The result is drought downstream and energy shortages upstream. The “resource-sharing system” has all but disintegrated, and the effects are visible. Upstream, Kyrgyzstan and Tajikistan face an energy shortage. In 2009, Uzbekistan, a major supplier of energy to Kyrgyzstan and Tajikistan, pulled out of the Central Asian supply system and started selling energy to higher bidders. This proved catastrophic in the upstream countries, whose high altitudes and bitter winters create a natural reliance on imported energy for heating. As the BBC reports, the energy crisis left not only people’s homes but public buildings like schools and hospitals without power. It was this energy crisis that originally drove the upstream countries to pursue hydroelectric power, in response to the dearth of energy exports from downstream that they had formerly relied on. A feedback loop was created, in which less power from one side leads to less water from the other, and back again. Downstream, rural farmers in Uzbekistan face diminished yields as their fields dry up. In 2016, Al-Jazeera reported that, according to local officials, farmers “are ready to kill each other for water.” Cotton farms, orchards, and subsistence plots that formerly relied on nearby water sources find themselves cut off from those familiar sources by borders created less than 30 years ago. Moreover, as agriculture makes up a significant sector of the Uzbek economy, it’s rural farmers who feel the brunt of this crisis. 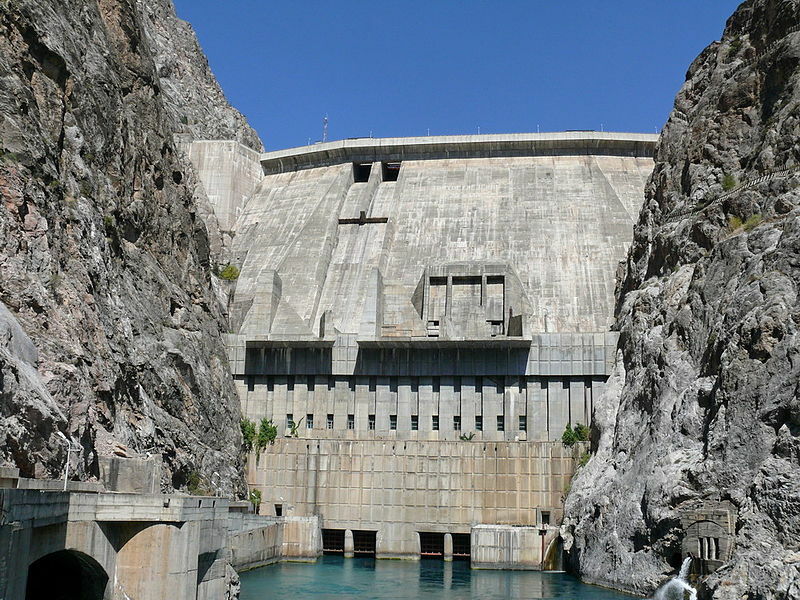 Controversy over the Rogun dam and hydroelectric power plant in Tajikistan illustrates the potential of the water crisis to lead to armed conflict. According to CSIS, “Uzbekistan contends that the dam would severely harm their agricultural system, whilst Tajikistan believes hydroelectric production is essential for regional and international growth.” Islam Karimov, Uzbekistan’s former president, was vehemently opposed to the construction of the dam. This was not only because it would negatively impact rural farmers, but also because of Uzbekistan’s somewhat lucrative cotton farming industry. In 2012, he directly referred to the possibility of war in the case that construction on the dam was completed. Later, in an October 2015 statement, Karimov warned that “[control] over water resources in the republics of Central Asia may lead to a full-scale war.” After Karimov’s death, Tajikistan continued construction, but the project has since been halted due to disagreements with Moscow, from which most of the project’s foreign aid originates. Finally, in 2016, Uzbekistan deployed troops to the Kyrgyz border partly in response to a dispute regarding Toktogul reservoir and power plant in Kyrgyzstan. The future, however, is not necessarily bleak. Neighbours in the region, namely Kazakhstan and China, are taking steps to successfully navigate a water and energy sharing partnership. In a similar situation, China controls the sources of the most important supply rivers into northwest Kazakhstan. As China’s ambitions to extend influence along the “silk road” came to the forefront of regional foreign policy, a diplomatic approach to water allocation to Kazakhstan saw success. The 2001 agreement on common use of cross-border rivers illustrates a degree of institutionalized cooperation that is largely absent among Central Asian neighbours. Furthermore, in 2011, the China-Kazakhstan Friendship Joint Water Diversion Project was launched. These types of agreements illustrate a diplomatic path that Kyrgyzstan, Uzbekistan, and Tajikistan would be wise to follow. Overpopulation and climate change, like anywhere in the world, are contributing to the water scarcity issue in Central Asia. The driving factor here, however, is uniquely political: mismanagement of resources on the government level and communication breakdowns between states with water and states without it. Unless leaders in Central Asia can learn to cooperate and manage resource sharing, a future of continued peace in the region is uncertain. Isabel Post is a U3 Political Science student with a double minor in Russian and Psychology. Having spent considerable time in the former Soviet Union, she is most interested in post-Communist political and economic transition in Eurasia, especially concerning ethnic minorities. In her free time, Isabel enjoys long bike rides, arts and crafts, and 90's sitcoms.